We've now reached more flashback chapters than there are present day chapters... so that's it. Not calling them flashbacks anymore. It's been a week since the Kamigawa incident and not a word from Tezzeret. He expected to be summoned their glorious leaders sooner than this, so when word finally comes to meet him in a courtyard outside, Jace wastes no time. Jace makes his way there, and before he really has a chance to get in a word edgewise (That's an odd saying, never used it before.) Tezzeret commands him to summon something. 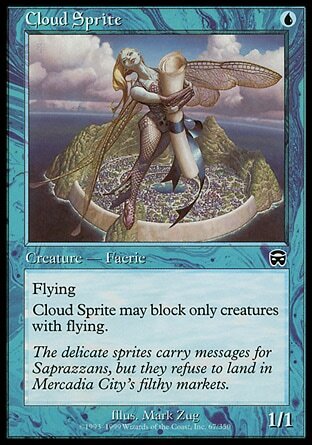 The command in Tezzeret's voice cannot be ignored, so Jace summons his trusty cloud sprite , a curious creature that's helped him many a time. Tezzeret's response is to throw an iron disk to the ground, apparently Tezzert's method for summoning, and a mechanized squid-like creature appears and tentacles shoot forth towards the fairy creature. One needle-tipped tentacles pins it to the wall and another tears the creature apart as it cries out in pain. The horror of losing such a familiar friend infuriates Jace, but Tezzeret doesn't care. He unleashes his creature on the mind mage and rains down blow after blow, and commands Jace to summon again. The blows continue and Jace understands that Tezzeret won't kill him, but also won't stop until Jace fends off the creature himself. 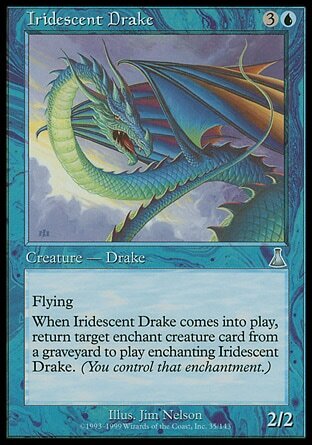 So Jace summons a drake, of an iridescent hue. His most powerful summons that always one him the day. The fight is ferocious, but in the end, the drake loses its life as well to the animated artifact. And Tezzeret gives the same command. 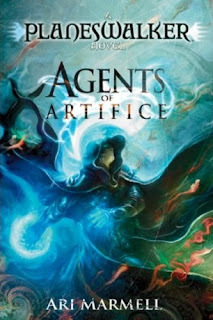 With no other creatures in his arsenal, Jace reaches out to a presence he had long felt but never had made contact with. It was by far a summons more powerful than he had ever attempted, but he had no choice. He called, and it came. 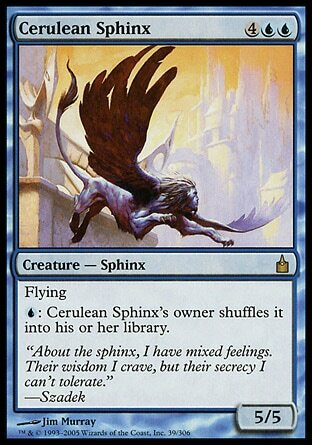 A sphinx bursts through the wall of a nearby building and it handled the artifact creature like a cat with its toy. When it's over, Jace gives the creature a smile and a bow, and sends it away. "Indeed." Tezzeret knelt until he could meet the younger man's eyes. "You've learned three vital lessons today, Beleren. You've learned that strength unused is strength you do not have, that you should never hold back your full potential. You've learned to call allies far greater than any you've yet commanded." "And the third?" Jace asked, trying hard neither to scream at Tezzeret nor to roll his eyes at hits "lesson." "You've learned that you already strip free will from other creatures when it suits you. What else are you doing, when you summon up a sprite, or a drake, or a sphinx, to fight and possibly to die for you?" And that third lesson Jace couldn't scoff at. It's not something he'd considered before. Tezzeret tells him that Jace needs to accept that's a part of himself, and the next time he's given a command, there will be no hesitation. Tezzeret leaves, and Jace knows there was a fourth lesson. Tezzeret didn't mention anything about Kamigawa, but the battering of his body was most assuredly his lesson in punishment. Even after going to the healers, Jace was still sore all over, but there was an urgent summons from Paldor, so he obeyed. In the office wasn't just Paldor himself, but a unfamiliar man as well as half a dozen soldiers all with weapons at hand to possibly use on this guest of theirs. This man was to deliver a message from Nicol Bolas, the ousted leader of the Infinite Consortium. Jace was to read his mind, but only to confirm the man's identity and purpose. He was under no circumstances to take it beyond that. And so Jace confirms his identity as Mauriel Pellam, and authenticates his purpose, and with that, Jace is dismissed from the room along with most of the guards. Before Paldor can continue, Jace opens up his pouty lips, and he spits outs asking if this will be "real world" easy or "Kamigawa" easy. Being the excellent manager of his employees that he is, Paldor addresses this right away in front of all the others. He asks Jace if he feels like he's been treated unfairly, and Jace says he feels like he's been punished for the faults of others. And with that, Paldor draw out his etherium dagger. His manablade. It was gifted to him by Tezzeret, and recently Tezzeret asked to borrow it. The knife not only severs flesh, but if used on a mage it severs their connection to mana sources. It's a process that is certainly excruciating. He used it on Baltrice with simple, shallow cuts. She was still alive of course, just truly punished, unlike Jace's slap on the wrist. And oh, the leader of the Kamigawa cell was also replaced, his retirement forced upon him by Tezzeret personally. I brought this up before, but I'll bring it up again, I like how these planeswalkers can't just summon up armies at their beck and call. It's just two or three creatures at a time before they feel exhausted. That seems to match up well with how they play as cards. Good stuff. I like how Jace scoffed at those initial lessons so we didn't have to. They're not holy words of wisdom or anything but seemed like they needed to be said, so Armell chose to hang a lantern on it. And the third lesson was a great way to get Jace to view his concerns from a different angle. I don't know how much I agree with it, but it's a good enough twisting of viewpoints that it's believable that it would get Jace to second guess how he's been feeling all along. We need to get back to the present already. When is this thing going to show up again, and who is it going to be aimed at. If Kallist wasn't already gone, that would have been my vote as to how he died. Oh of course! That makes so much sense. Tezzeret did mention there were some free agent planeswalkers that worked for them from time to time. That seems the obvious way to get her into Jace and Kallist's lives. I should have guessed it, and I feel a little foolish for not doing so.